Simon & Schuster, 9781451690422, 320pp. A member of the world-renowned Program on Negotiation at Harvard Law School introduces the powerful next-generation approach to negotiation. The Art of Negotiation shows how master negotia­tors thrive in the face of chaos and uncertainty. They don’t trap themselves with rigid plans. Instead they understand negotiation as a process of exploration that demands ongoing learning, adapting, and influencing. Their agility enables them to reach agreement when others would be stalemated. Michael Wheeler illuminates the improvisational nature of negotiation, drawing on his own research and his work with Program on Negotiation colleagues. He explains how the best practices of diplomats such as George J. Mitchell, dealmaker Bruce Wasserstein, and Hollywood producer Jerry Weintraub apply to everyday transactions like selling a house, buying a car, or landing a new contract. Wheeler also draws lessons on agility and creativity from fields like jazz, sports, theater, and even military science. Award-winning Harvard Business School Professor Michael Wheeler has taught negotiation to thousands of MBA students, executives, managers, and public officials from companies and organizations around the world. Wheeler is editor of the Negotiation Journal, published by the Program on Negotiation at Harvard Law School, and co-chairs the board of the non-profit Consensus Building Institute. He lives in historic Gloucester, Massachusetts, his hometown. "Professor Wheeler creatively pulls from vastly different professions such as NASCAR drivers, jazz musicans and improv actors, expanding our awareness of negotiations and equipping us with practical, innovative tools to navigate complex negotiations." "The secret to successful negotiation is not just preparation and a good plan, but inspired improvisation. Until now, there has never been a book on this all-important and neglected aspect of negotiation but now, thanks to Mike Wheeler, we have a beautifully written, insightful and practical guide to the "jazz" of negotiation. The Art of Negotiation is a real gem and an essential contribution to the literature!" "Michael Wheeler has written a new business classic. He presents powerful negotiation strategies and techniques for managers in any industry." "Whether to build partnerships or to overcome differences, the art of negotiation is crucial to today's nonprofit organizations. Michael Wheeler's book is an eye-opening guide, replete with data, metaphors and compelling stories, on how to negotiate creatively, imaginatively and effectively." "Negotiation is not a linear endeavor. It’s full of twists and turns and requires managing relationships, data, intuition, and alternatives in a way that increases the probability of a good outcome. Wheeler knows this subject as well as anyone and shows us how the best negotiators are like great scouts; constantly probing and challenging assumptions to find the value that is beneath the surface." "Getting to Yes meets 'Round Midnight' in this highly readable exploration of the twists and turns of real world negotiations. In his new book, 'The Art of Negotiation', Michael Wheeler provides terrific practical guidance on dealing with the predictably unpredictable ways negotiations fail to stay on script." 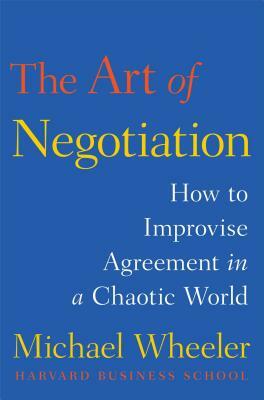 "[T]he book is a good basic guide to making the best of a negotiation."